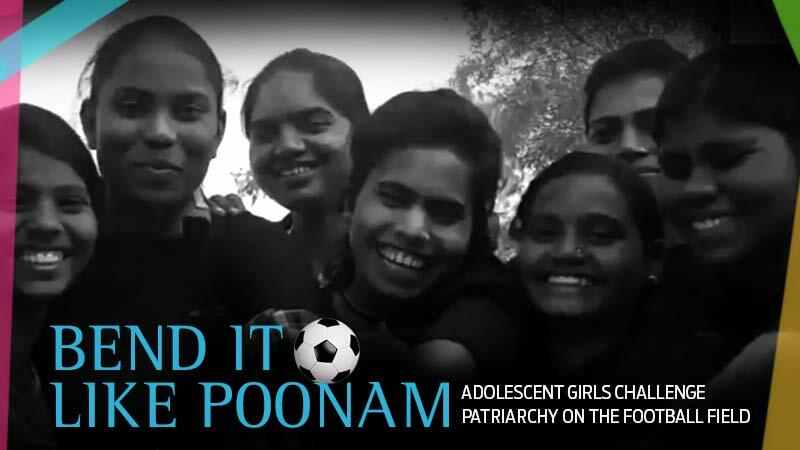 Poonam is a teenager from Varanasi. She used to firmly believe that girls should stay at home and eventually get married. “Today I feel girls should have full freedom,” she says. What changed for Poonam? She and a bunch of girls in her community learnt to play football. “When these girls play, they play very freely: they don’t care if anyone is staring at them, their breasts. It’s an expression of complete freedom as if they are flying in the playground!” says Rekha Chauhan, Project Director of Mahila Swarojgar Samiti (MSS). Systemic gender discrimination means that adolescent girls face challenges on multiple fronts. Secondary school dropout rates among adolescent girls are much higher. Teenage pregnancy and marriage also pose grave risks to them. More adolescent girls are malnourished and underweight than adolescent boys. Over 50% of girls between 15 and 19 years are anaemic in the country. Coupled with this is crippling social restrictions that restrict mobility and freedom. Playing sports can often be seen as a masculine activity. Those who challenge this often face societal censure. And even when their families are supportive, institutional neglect often force young girls from poorer families to give up their dreams of becoming sports stars. At the same time, each success story, like the gold medal, winning Tajamul Islam from Kashmir, inspire a lot of other girls. The programme undertaken by MSS is doing exactly that- creating a space where girls take up sports and encourage other girls to do the same. 75% of the girls in these groups attend school. About four or five are already married. All the girls come from Dalit or Muslim communities. After joining the group, some girls have been able to take concrete steps in changing their families attitudes. Several have been able to negotiate their ways out of teenage marriages. Despite it being illegal for girls below 18 to get married, the practice is widespread especially in economically weaker communities. Rekha knows why such a sea change is possible with a seemingly innocuous thing like football. Girls are used to playing other sports like kabaddi, the Indian national sport. “Football has remained an unchallenged male domain. When they succeed in a supposedly ‘male’ domain, their confidence grows. They see that they are capable of what was a taboo for them and are eager to break down other restrictions,” she says. Indeed, research from across the world confirms that playing team sports is an effective means of boosting self-esteem in adolescent girls, particularly those from marginalised backgrounds. Kudos to MSM and the teenagers in Varanasi for bringing this to fruition. May their example show the way to many more communities across the country.